Our new release 2.15 is out! After 8 weeks of intense work, we’ve added many new features and improvements that will help you work faster and manage your business better. 1. New e-signature infrastructure: After a thorough internal review, we discovered that almost 5% of Knowify e-signature attempts by 3rd parties (ie, your customers) were encountering difficulties. Most of these issues were due to old browsers or very high security settings, but even still we knew that that % was much too high. 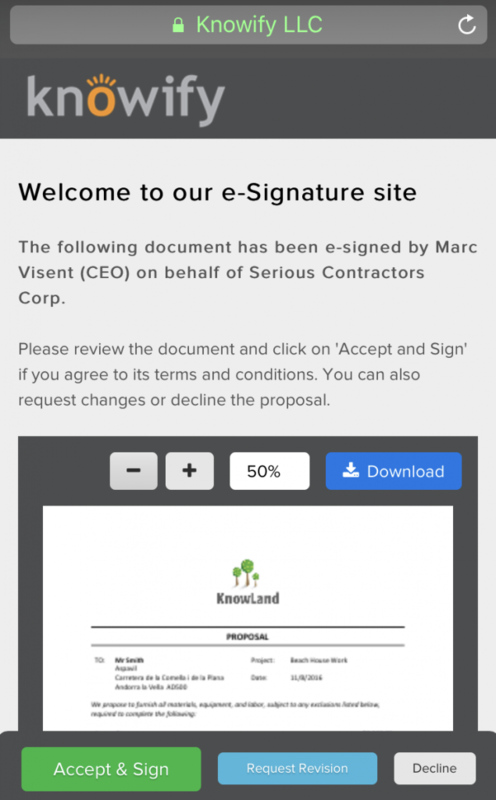 We completely rebuilt e-signature as a result. We expect far fewer issues going forward, with the added benefit of a better mobile-phone experience. 2. We’ve deployed the infrastructure to process credit card and ACH payments from your customers. This feature will be available to everyone by the end of the year. 3. Quick import from spreadsheet for plans and proposals: Easily paste multiple lines from any spreadsheet to a project plan or proposal in Knowify. This feature gets you one step closer to eliminating any double entry of data. 4. Ability to add manual locations when our map service cannot find the address. This will help you deal with new developments. Just drop a pin in the map so that we can get the exact GPS location. 5. Better support for taxes in Canada and Mexico: for our international users, we have improved the ability of Knowify to manage multiple tax rates in one single invoice. 6. Improved sorting of line items in invoices. 7. Maintenance contracts: we have modified the language in our default template to better support per-visit billing. Keep in mind that we can customize these outputs for you. Just ping our customer support team. 8. Editing purchase orders will now modify any associated billable items when dealing with time and materials jobs. 9. Faster management of purchase orders: for those dealing with hundreds of open POs, we have improved the PO section to speed it up. 10. When you convert a service ticket into a contract job, we have improved the management of existing purchases and time entries so that they all display in the plan&track section. 11. We finally got rid of certain validations we had in the clients and vendors sections around emails. Now you can create/update different clients/vendors with the same email if you wish to. 12. 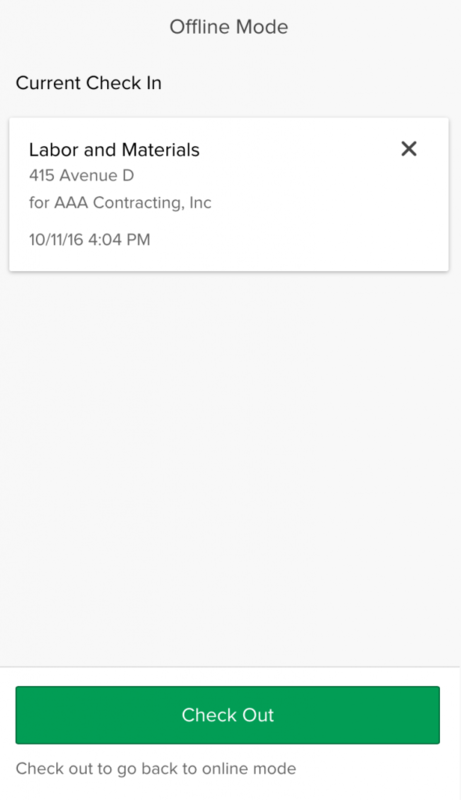 Vendors marked as subcontractors (or 1099s) can be associated with mobile users now. This will let you give access to our smartphone app to your subs if you wish to. 13. 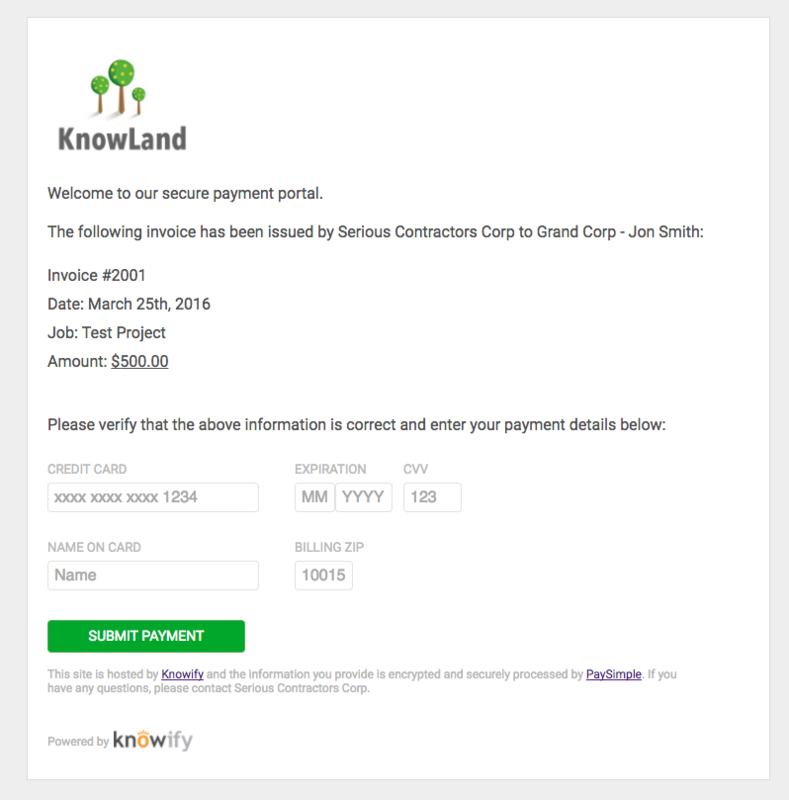 When processing vendor bills, we have included a warning if you are trying to add an invoice number that already exists on Knowify. This will avoid any double-entry issues. 14. Faster management of time entries: the review time section will be faster with our latest changes. 15. When adding new users, we have a new feature that helps you autocomplete the email address. Quite simple, but who wants to type all these domain names? 16. When creating invoices for your clients, you can now set the the markup for items coming from your catalog. We will also pull both cost and list price for these items. 17. Our catalog section has changed. There was unanimous feedback from the Knowify community to make it a regular table, so it was pretty obvious what we had to do. 18. Support for inventory items in catalog. You can now import inventory items from QuickBooks Online into Knowify. 19. Variable deliverables in other agreements will let you bill your customers by visit. Knowify will calculate the number of visits based on the number of time entries when you are about to create the invoice. 20. Support for QuickBooks Online categories: this is just a first step towards merging QuickBooks Online categories with Knowify tags in the catalog. This will be fully functional by the end of this year. 21. Final deployment of our infrastructure to support QuickBooks Desktop. Stay tuned, because we have many improvements coming up by the end of the year, namely all our new features around our partnership with GAF and the ability to process credit card payments with Knowify. 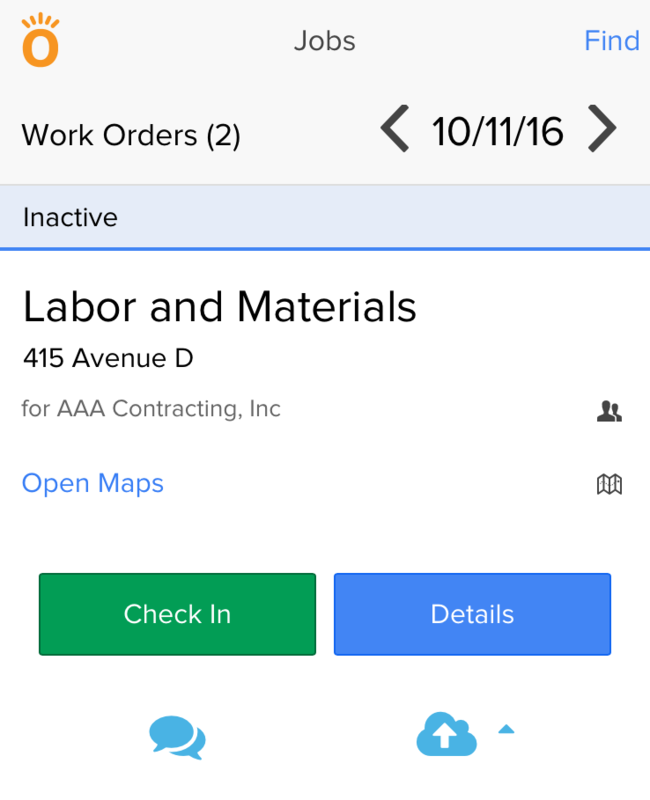 Tracking labor time is an essential process for most construction companies, whether for payroll, measuring job progress or time and material billing. At Knowify, we’ve seen all sorts of outdated methods for tracking time: from people calling the office and leaving a voice message with the number of hours (ouch!) to paper sheets filled out by the foreman on the jobsite. It’s 2016! There are much more efficient ways to track time! With the Knowify mobile app, not only will you get to enjoy high automated timekeeping, but you will also be able to see in real time how your job is performing. That’s a big deal! 1) Individual check in / check out (online): This is the most precise way of tracking time. 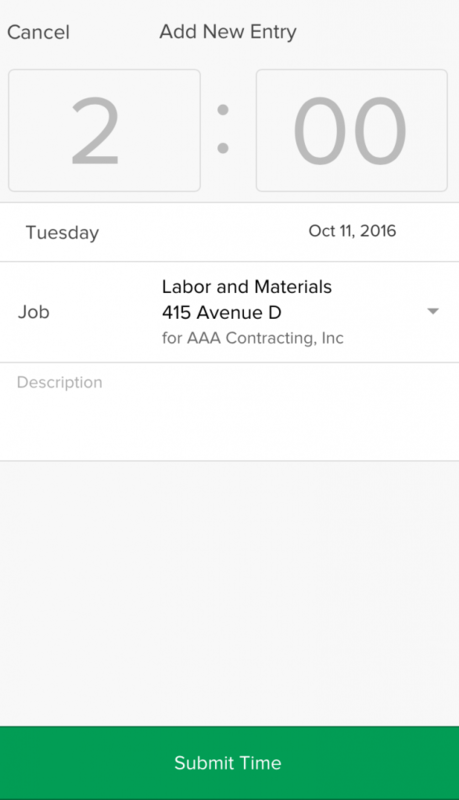 In the first tab of the smartphone app, you’ll see a list of scheduled jobs. 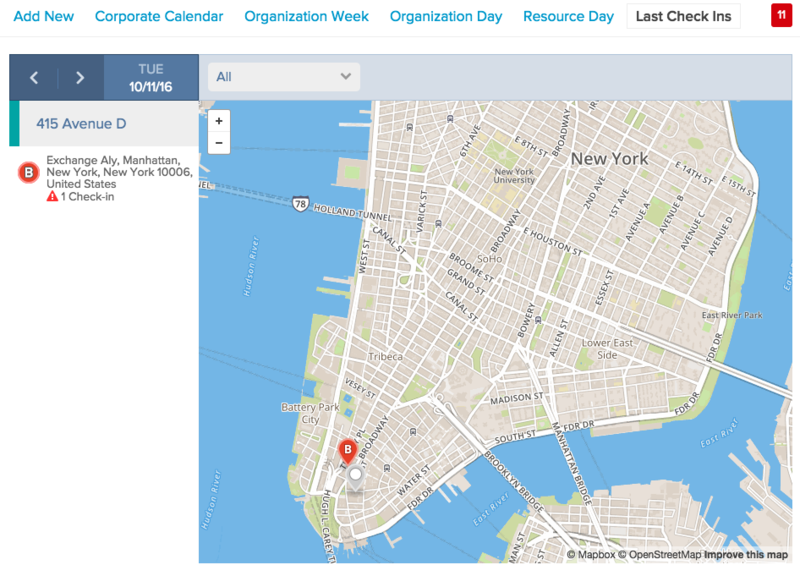 You can check into any of those jobs (or use the “Find” feature to check in to an unlisted one) and we’ll record the GPS location and the check in time. Upon checking out, we record the GPS location and the check out time, and calculate the time and cost associated with the time entry for job costing purposes. No more waiting until the end of the week or the month to know where you stand: have that information in a timely manner, enabling you to make better, faster decisions in your business. 2) Individual check in / check out (offline): When you have low or non internet connection, you can still use the app to check in and out. On the login screen, just click ‘Enter offline mode’ to stop relying on your internet connection. Now, if you wish to check in just select a job from the list and check in. If you don’t see the job (probably because with no internet connection you couldn’t download it), just click on Basic Check In and the time will be stored but unallocated. You’ll have a chance in the office to point it to the right job. You might be wondering: if there is not internet connection, how do these time entries get uploaded into Knowify? Well, we definitely need internet connection at some point to make it work. Whenever you recover the connection, just log into the app and the time entries will be synced up with your account. 3) Foreman timekeeping (online): Many companies don’t want to leave it to their guys to enter their own time; they prefer to have a foreman or supervisor doing all the tracking. We get it. In the second tab of the smartphone app you’ll find the Forman section, where you can enter time or check in/out your crews. 4) Manual timecard entries (online): This is the most manual way of entering time, but it will also give you the flexibility to select the time and job. The downside is that we will not be able to record the GPS location. You will be able to manually add time in the third tab of the smartphone app. When you are there, just click on ‘Add Time’ to get started. As you can see, we have quite a few options to track time. 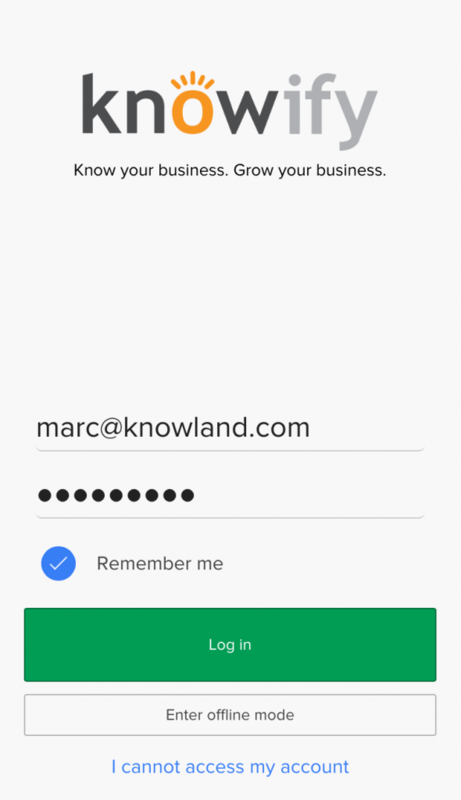 We know that every business is different, so we built the Knowify mobile app to have the flexibility to work in almost any situation. Finally, keep in mind that any time entry submitted through the smartphone app can be adjusted from the office. For instance, if one of your guys left his phone at home, you can check him in and out from the office. You can also check him out if he forgets to check out at the end of the day. Do not hesitate to contact us if you have any questions on how to track time in your company. We know dealing with new technology can be frustrating sometimes, that why’s we have the best of the best in our team to help you out. You can find us at support@knowify.com. These days, it’s pretty easy to start a business. Maybe you started your career as a laborer. Then you picked up a couple of small jobs on your own (friends of friends of friends). Then you had to get more help. You hired a pal to take on some of the work, and suddenly you had to get more serious. You printed up business cards, started chatting up architects or interior designers, made friends with the staff at the local hardware store, or Home Depot, or Lowe’s, asked for and referred business to other contractors or subs who don’t do what you do, posted your card or flyer on the corkboards at any local store or diner that would have you. Then what? If you are still reading this, then you did not just sit around waiting for the phone to ring. You’re still in business. Growing that business is another matter. How about your accountant? Accountants see how other business, whether in construction like you or in other industries, start and evolve all the time. They should be an expert resource. Is yours? Residential GC-ing, managing subs or even being a subcontractor managing clients, supplies, people, and jobs, is a lot harder than it looks. Add to that, managing your back office — contracts, invoices, collections, timesheets…the list goes on…it’s enough to make a normal person’s head explode. Ask your accountant for recommendations on how to run your business more…well…like a business. You’re a contractor and a business owner, not a paper shuffler. There are lots of systems that take the pain out of bookkeeping (QuickBooks is one), and others (like Knowify) designed to help contractors manage the rest of their business efficiently and profitability– in and out of the field. Does your accountant have it? Or is the firm simply “doing your books?” Accountants can be very expensive bookkeepers if they are not also advising you on best practices for running and growing your business. Ask for help. Demand recommendations. Discuss the tools and technologies available to you to evaluate the profitability of every client and every job so you can plan ahead. Are you bidding accurately? Allocating time and materials appropriately? Do you know where your people are and what they’re doing? You should. Accessing tools to deliver real transparency into hours, job assignments, client management, and productivity to ensure projects stay on schedule and on budget can make the difference between eking out a living and making real money. And maybe even cut down the back office cleanup you do nights and weekends. How do you get there? Do your research. Knowify, for one, can help. We’re already helping contractors integrate their business management needs with accounting systems like QuickBooks from an easy-to-use interface accessible from any device — in the field and in the office. Earlier this year, Guillaume Bailly, a GAF Center for the Advancement of Roofing Excellence (CARE) manager in Canada published a blog on exploring the key distinguishers between contractors who succeed and contractors who…don’t succeed. Like any small-to-mid-sized businesses, the owners/manager of construction companies, subcontractors and the trade all too often gets caught up in or even overwhelmed by the daily minutiae of running their businesses — finding the work, putting out fires, managing teams, overseeing POs and change orders and… With only 24 hours in a day, taking a moment to look at the big picture — “How are YOU doing?” seems like an extravagant luxury. But it’s not. And GAF CARE Manager Bailly asks that contractors consider what he calls the “killer” question: When was the last time you took a moment to think about your company’s vision (that aspirational description of your company’s long-term goals or mission) — the Who; or the What — your plan to get you to your goal; and the How – the tactics you’re going to employ to reach those goals or achieve your mission. The most common response to those questions is: “It’s in my head. I know all this.” In your head is invisible — out of sight and out of mind. If you’ve never thought about the who/what/how of your business, or haven’t reviewed your situation for more than a year…Labor Day weekend is as good a time as ever to put those wheels into motion. Write down your who/what/how and then share your notes with your key employees the Tuesday after the holiday. Bailly, who’s been training roofing contractors of all sizes for the past three years says, “When I walk into a successful company, I always see a mission and vision statement on the wall somewhere, and when I dive deeper into their operation, that vision is easy to see. [And] when I ask them about their plan this year, they typically correct me and say: ‘Our strategy is…’ as opposed to giving me a sales number such as $2 million. Part of the problem Bailly was addressing is time management. Whether you are running a two-person shop or a 150 member team, finding the time to work on your business is ever so much harder than working in your business. That’s why we created Knowify (that’s our commercial! ): Our mission/vision is to help contractors run their businesses efficiently and profitably. And that means reducing time-consuming paperwork. We believe that in an environment where everyone you work with and work for has a smartphone, a laptop, or a tablet, there is no place for paper spreadsheets, timecards, and paper-intensive estimates, billing, or change orders. It is possible to be a craftsperson and efficient. You can deliver old-school customer service while running your back office on new school technology. Why not run your business, your estimating, your purchasing, jobs progress/change orders, and labor on tools designed to make your life easier? US Homebuilders are happy…but are they profitable? According to Sam Ro, managing editor of Yahoo Finance, life is good for American homebuilders. He cites the earnings of such large residential developers as the publicly-traded PulteGroup (PHM), which reported a 41 percent increase in home sales revenues and a new order pipeline that jumped up 21% to $2.1 billion. Good business = good economics? Well…according to the US Department of Labor, the US economy looks great. Earlier this summer, 287,000 new jobs were added, well over the 180,000 new jobs economists expected. Retail sales are strong. Mortgage rates are low. Banks are lending. In many areas, the supply of homes for sale remains tight. This is especially true in the affordable entry-level segment of the market — homes for first-time buyers and replacement homes for existing homeowners looking to upgrade. According to a Zillow Real Estate Market Report released this summer, homes are selling faster than they have since 2010. The issue is inventory. In many parts of the country, the urge to buy far outstrips the supply for sale. Nationally, there are 4.7 percent fewer homes on the market than there were a year ago. Rising home prices do make it tempting for current owners to sell, but then what? Where will they go to? Concerned they may not afford an affordable replacement home, many do not put their houses on the market. Good news for big contractors…what about you? For many residential GCs, commercial/residential subcontractors, and the trades, business also is booming. Buoyed by people staying put, and renovating. Boomers who stay in their homes, renovate to accommodate changing lifestyles, changes in mobility, even boomerang children and grandchildren. First-time home buyers, looking to move, are stymied. So, they often “upgrade in place,” throwing up new walls, upgrading fixtures, or otherwise sprucing up their current living situations — even as renters. Some contractors say they are so busy, they don’t even have time to bid on new business. Bad. Bad. Bad. If this is your first rodeo as the owner of a construction-related company, you should know these good times will not last forever. For those who’ve survived a recession or two…how many times do prospective client have to call your cell phone before you finally send them your estimate? We all know that today’s jobs will end. And then what will you do? Start looking for business before or after you run out of money? Estimating should be easy – click, click, send If you’re meeting with prospects, you’ve already invested substantial time. Don’t let it go to waste. Send over your estimates. If paper is a problem, then automate. You’re a contractor and a business owner, not a paper shuffler. So, maybe it’s time to give up your Excel spreadsheets for something more efficient? Ask your bookkeeper, or your accountant about tools and technologies designed to help you work on your business, not in your business. Ask about tools that help you run your business with an eye towards delivering profitable returns on every job you take on. They are out there! Are you bidding accurately? Allocating time and materials appropriately? Do you know where your people are and what they’re doing? You should. Accessing tools to deliver real transparency into hours, job assignments, client management, and productivity helps you ensure existing projects stay on schedule and on budget, and help you quickly collate and submit estimates for new business. These tools can mean the difference between eking out a living and making real money. And maybe even cut down the back office cleanup you do nights and weekends. NAHB promotes systems-built homes…got a systems-built business? Members of National Association of Homebuilders’ (NAHBA) Building Systems Councils celebrated Building Systems Week with programs to educate members and homebuyers on the advantages of systems-built homes versus traditional stick-built homes. Systems to build homes. Systems to build business. For homebuilders, proponents say that systems-built housing addresses issues of cost and availability of labor. Prefabricated components ranging from modular, panelized, concrete, and log- and timber-framed houses reportedly require fewer man hours to build once they arrive on site. If according to NAHB’s Building Systems Council, systems-built construction makes it possible to build new homes faster, cheaper, and greener, it can be a viable option for some residential contractors — much like drywall has replaced plaster wall construction. The same holds true for every contractor’s business operations. Do you run your business on Excel spreadsheets (stick-built or plaster) or do you run your business faster, cheaper, smarter by availing yourself of “systems-built” technologies that help you automate virtually every aspect of your back-office operations. Whether you are a one-person shop or a multi-team/multi-location operation, accessing tools to deliver real transparency into hours, job assignments, client management, and productivity to ensure projects stay on schedule and on budget can make the difference between eking out a living and making real money. And maybe even cut down the back office cleanup you do nights and weekends. There is a place for stick-built construction. There likely always will be a place for stick-built construction. But there no longer is a place for paper spreadsheets, timecards, and paper-intensive estimates, billing, or change orders. Not when everyone you work with and work for has a smartphone, a laptop or a tablet. You do have a choice. You can be a “stick in the mud,” or you can introduce yourself to and take advantage of all the very easy to use technology available to you. Using a hammer and a nail gun? Installing laminate wood flooring and laying down hardwood boards? You can do both — be a craftsperson and efficient. The same holds true for your business — you can deliver old-school customer service while running your back office on new school technology. Why not run your business, your estimating, your purchasing, jobs progress/change orders, and labor on tools designed to make your life easier? If you are a QuickBooks Pro Advisor looking to build your construction practice, click here now to register for the Woodard + Knowify Construction Advisor Network Webinar Thursday, July 28th at 4 pm EST/1 pm PST. Learn how this Network designed specifically for advisors can help you grow your practice and help you help your existing clients. The Woodard + Knowify Construction Advisor Network offers a game-changing opportunity for you to expand your advisory business by helping you identify the biggest opportunities and enhance and strengthen the service you deliver to clients. Membership is FREE and delivers access to industry primers and best practices sheets/checklists right away. Plus, you have access to the some of the most experienced professionals in the business across the country — your peers and the ongoing support of Woodard and Knowify. Funnel new business leads to help them grow their practices. Founded by Woodard, the Intuit-centric resource for accountants, and Knowify, the QuickBooks-compatible business management software solution for small-to-medium contractors, The Construction Advisor Network also is the home of best practices, proven methodologies, and systems that permit you to deliver appropriate solutions that lead to great outcomes for your clients. It’s official. 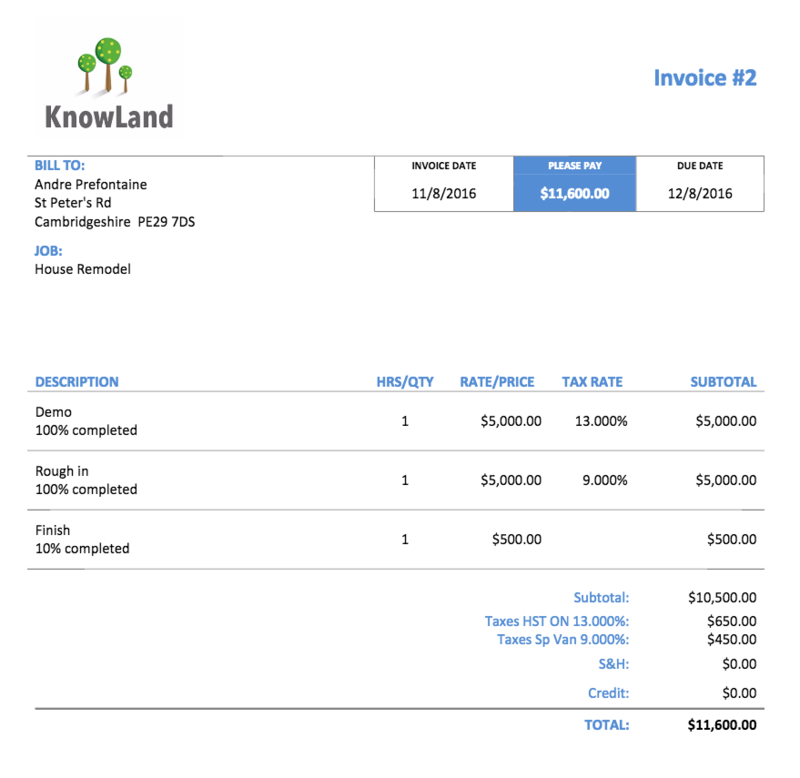 Knowify and Woodard have teamed up to launch the Construction Advisor Network, designed for accounting and QuickBooks ProAdvisors already serving or interested in serving small to medium sized contractors and subcontractors. Why does best of breed advisement and technology matter? You know how disorganized your clients can be. Historically, construction company owners laser focus on getting new business in the door and completed projects out the door. They rarely pay attention to process improvement and business management metrics. In fact, it’s not uncommon for even large subcontractors to hold tight to old software and inefficient administrative processes. As their advisor, how many hours have you invested in prying paper spreadsheets and random Post-it notes out of their hands and out of their files? If you’ve managed to switch your clients to QuickBooks Online, you’ve already won half the battle. Step two is to migrate them away from office wall calendars and desks stacked high with timesheets. Guide them into the digital world and the possibility of running their contracting business cost-effectively and efficiently from a tablet and smartphone — anywhere. If you’re an advisor seeking a bigger piece of the more than 1.2 million small- and medium-sized construction company market, the Construction Advisor Network offers a game-changing opportunity — Three tiers of FREE membership to generates leads and revenue for you and your firm. The first three months’ revenue from that account. A perpetual revenue share (up to 30%) for accounts you introduce. Plus, we’ll offer prescreened leads in your area to help you grow your business! Tier III – Partner: You are a Knowify pro with a host of successful implementations. Ongoing leads and revenue share, plus we’ll feed you other ProAdvisor relationships to mentor (especially from Tier I!). The Construction Advisor Network is all about creating win/win situations for every member. Based on your firm’s level of involvement, the Construction Advisor Network can generate new leads for your practice and deeper connections to your clients as you build expertise and add new service offerings. The Network also will be the home of best practices, proven methodologies, and systems that permit you to deliver appropriate solutions that lead to great outcomes for your clients. Click here for information. If you have any questions or wish to share your feedback, you can find us at support@knowify.com. Be smart. Be profitable. Build your business now! You’re very good at building things. Kitchens. Bathrooms. Homes. Apartments. How good are you at building profitability into your business? Click here to register for this free, deep dive Knowify + QBpro Consulting webinar. Hear key strategies to run your contracting business more efficiently, cost-effectively, and profitably. We’ll discuss and demonstrate best of breed contractor-specific solutions for estimating, planning, managing clients/jobs/teams/materials/change orders, building workflow collaboration, and organizing payroll, bill paying, receivables management and financial reporting to help you meet your profit goals. Sign up now for this hour long, one-two combo knockout — Knowify + QuickBooks — and master contractor job management.